Spooky had just clicked off his Blackberry after making two high level decisions, one that changed the course of an important strategic alliance and another that would expand his company’s business profile. Despite being a Libra Spooky is emphatically NOT indecisive. In his case the opposite is true: He processes as much relevant information as necessary to make intelligent decisions with the speed and the precision of a guided missile. I suppose it’s the speed part that makes all the difference: He’s as Libran as any Libra; he’s just so fast you can’t tell. I knew Spooky was successful and smart, and I’d just recently discovered he was clairvoyant. What I didn’t know was that Spooky is a master strategist, a freakin’ genius, for real. Spooky has three (!!!) masters degrees, owns and coaches a semi-professional football team whose reputation is on a national level: Both as national champions and as one of the best if not THE best run organizations in the country. He’s also unbeatable at strategic war games, sublimely appropriate ones, such that if I were to tell my conspiracy buff readers what those games are they’d laugh their asses off. Talk about multi-tasking! Geez. It’s odd, though: Spooky has never used a strategy on me. That I’ve noticed, I mean. He will tell you that is not his style. “I don’t have time for games with you,” he’s said on more than one occasion. In fact he would say in a twist on Sun Tzu that “the absence of strategy is in fact a strategy.” It was the only one that could have worked with me in the first place. What I can’t yet figure is . . . how did he know? Thank GOD. I hate messing around. As our story has gotten more convoluted and weird Spooky’s advice has been most valuable. I have several posts in draft, and they’ve taken on a supernatural tone. Freaky psychic-premonition stuff. Events that seem pre-ordained. I’m almost afraid to click the “publish” button. 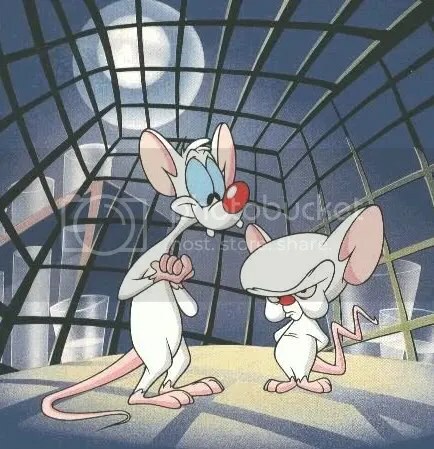 “Why not, Pinky?” Spooky was the Brain. Totally. “Now you’re talking.” And he tapped the end of his nose as though he were playing charades.